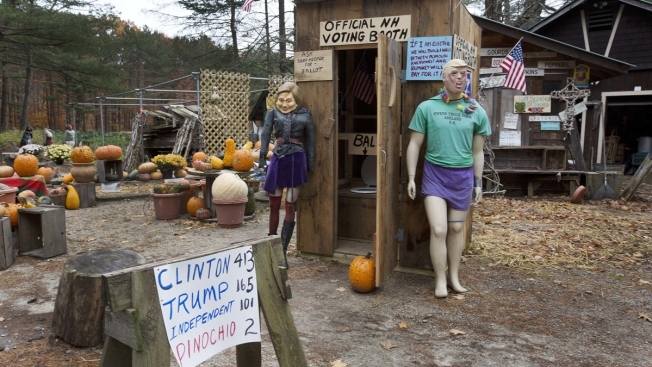 A week before Election Day, a New Hampshire farm stand owner has decided to tally customers' votes for president from an outhouse-turned-fake-voting booth. The winner: Hillary Clinton. Chris Owens, of Ashland, built the device with mannequins of Democrat Clinton and Republican nominee Donald Trump, and toilets to cast ballots. New Hampshire Public Radio reports with 721 ballots cast in the last month or so, the results of the 2016 Outhouse Vote are 413 votes for Clinton; 165 for Trump; 101 votes combined for Libertarian candidate Gary Johnson and Green Party candidate Jill Stein; 40 write-in votes for Democrat Bernie Sanders; and 2 votes for Pinocchio. President Barack Obama and First Lady Michelle Obama hosted children and their families on Monday to celebrate their last Halloween in the White House. Obama told guests it was the one day parents "don't have to pay attention" to Michelle's healthy eating tips, suggesting that the later kids eat their candy the better.